Toyohara Kunichika (1835-1900) One Hundred Roles of Baiko: Shinohara Kunimoto, 1893. Oban. In 1893 Kunichika was commissioned to produce the series, '100 roles of Baiko' Baiko was the stage name of the Meiji actor Onoe Kikugoro IV. This series differs from the similar series '100 roles of Ichikawa Danjuro' in that the upper portion of the print shows a supporting role from the performance. The whole series was produced to the highest standards of deluxe printing, using burnishing, mica and embossing. 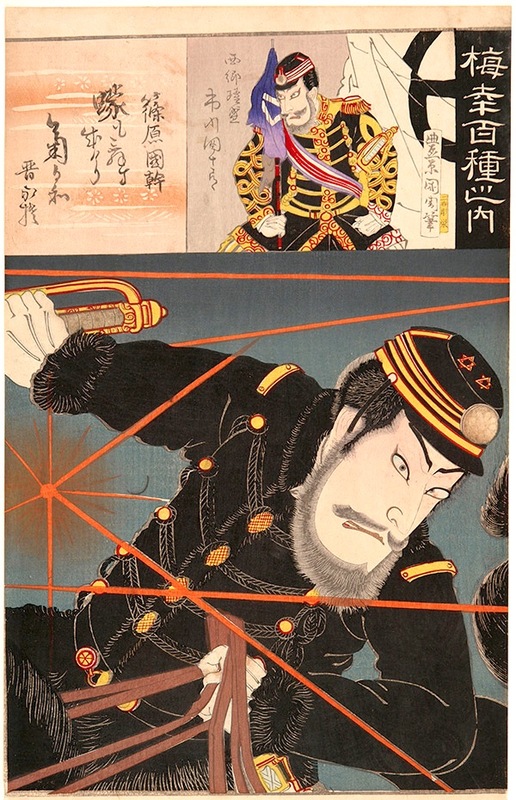 This woodblock print depicts Baiko playing the Satsuma soldier Shinohara Kunimoto in battle. How different this is from traditional samurai prints: Baiko wears modern dress uniform and modern shells burst and explode across the page. Instead of traditional samurai looks, Baiko wears a neat moustache and beard, signifiers of the 'new' age. The inset shows Ichikawa Danjuro IX as Saigo Takamori who led the Satsuma rebellion against the Meiji army in 1877. A fine print, in good condition, some trimming to margins, colour very good, fine impression with extensive mica to the background and complex burnishing to the uniform. This print is illustrated on page 132 of Amy Reigle Newland, Time Past and Time Present, Images of a Forgotten Master, Hotei Publishing 1999.